Children love playing with sand pits and playing with water. 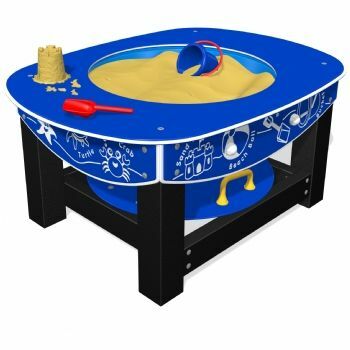 So we have created the Sand and Water Basin, which is a freestanding table unit with its own lid suitable for both sand and water play, Because it is constructed from HDPE materials, it will happily stand outdoors all the time. It is easy to clean and will not root, crack or splinter like timber products can. The Sand and Water Basin is supplied fully assembled and can be left freestanding in the playground, however if you do wish to fix the unit down, ground anchors are available at extra cost.